OS X Lion: Where did "Save As" go? OS X Lion: Where did “Save As” go? Apple is starting to move away from the traditional file system with OS X Lion. One of the consequences of this action is that the “Save As” command is becoming obsolete. Here I will describe why this is occurring and how to accomplish the tasks that were traditionally performed with the “Save As” function. “Save As” is dying. The Lion API establishes these changes. In fact, the Lion version of applications such as Preview, Textedit, and the iWork programs all have lost this traditional command. With the success of iOS, Apple will hiding the file system more and more. For a long time now, OS developers such as Microsoft and Apple have realized that the majority of users do not understand file extensions and the various file types. This is why Microsoft hides the file name extensions by default in Vista and Windows 7. In iOS the user never really has to worry about file types. Each application keeps track of its own files. 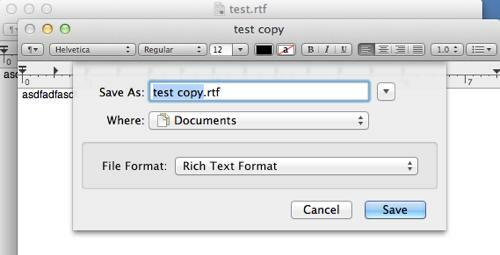 Lion now incorporates the creation of Versions and the autosaving of files. Through Versions the user can not just see the most recent saved version of a file but can also see multiple previous versions. Saving multiple versions in a traditional file system would require multiple, differently named files such as vitae1.doc, vitae2.doc, vitae3.doc, etc. However, with Apple’s goal to simplify the file system, all of these versions appear as one file to the application. Now because of these changes, the traditional “Save As” command no longer makes sense. Instead, if you want to “Save As” to create a different version (maybe for backup, for example), you can just Save A Version. You can create as many versions under that same document as you wish. As Dusty points out in the comments below, if you looking to save the file to rename and to move to a different location, that will now require two steps. First, you will have to Duplicate you file. When you Save this file, you will be presented with the classic “Save As” dialog box that allows for renaming and relocating. 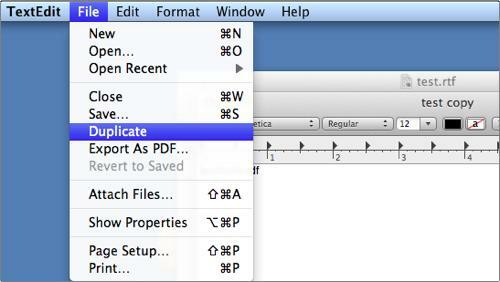 Applications using pre-Lion APIs will still have the “save as” function; however, the new Versions features will not be available. As programs are updated, the majority of them will also be converted over the to new API. 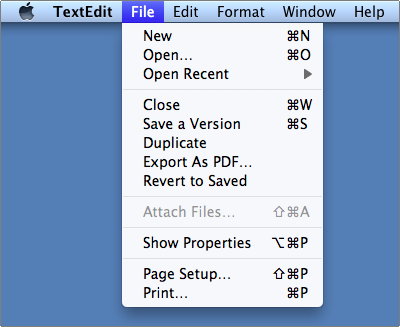 The “Save As” function in OS X is a dinosaur soon to be extinct.